One of the most fascinating historical romances is that of Saint Cecilia, the patron of music. Since there has been much in print that is very far from the facts revealed by the best historical sources, the following is given to Etude readers who desire what is deemed authoritative information about this famous woman. St. Cecilia was of Roman birth and came from a noble family. She was educated in the Christian religion and vowed to become a celibate in order that she might give herself to the service of her faith. Her parents, however, compelled her to marry a young Roman noble named Valerianus. As he was a Pagan she strongly objected to this marriage. After the marriage, however, she induced Valerianus and his brother to accept the Christian faith. This angered the Pagan authorities, and when they found that neither St. Cecilia nor Valerianus and his brother would give up their newly adopted faith they were ordered to be executed. Both men were decapitated and St. Cecilia was put in a huge vessel like a cauldron and placed over a fire. Her cruel persecutors, finding this diabolical death not quick enough, ordered her decapitated. Historians fail to agree as to the time of these events. Some state that they occurred in Rome about the year 229 A. D.; others that they happened in Sicily under Marcus Aurelius about 178. 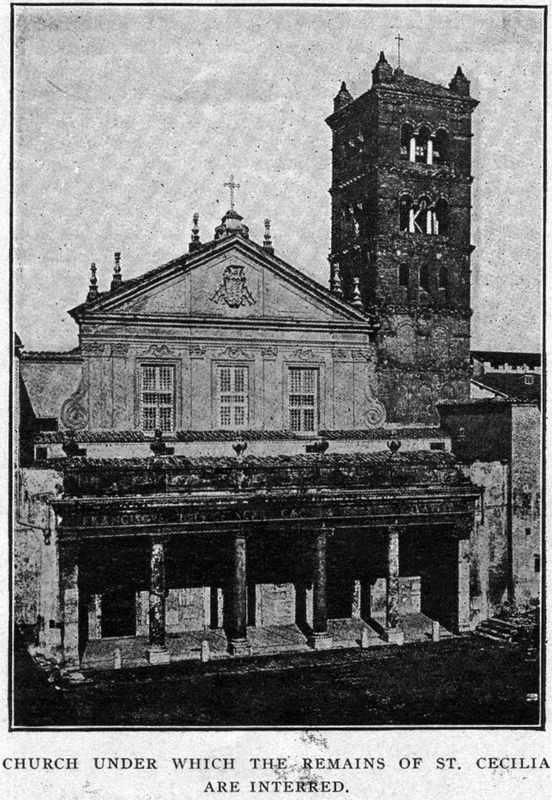 Her home in Rome, where she is said to have been martyred, was converted into a church and the remains of the victims of Roman cruelty were interred there in 821. The church was rebuilt in 1599 and a monument to the Saint Cecilia erected there. The tradition which associates St. Cecilia’s name with music is that an angel heard her sing and was attracted to earth by the beauty of her song. In most of the paintings of St. Cecilia this tradition is represented. Grove says, however, that the early writers make no mention of her wonderful musical skill. In 1594 a lengthy poem by the Italian Castelletti, called “La Trionfatrice Cecilia,” contains no mention whatever of her supposed musical ability. A century before this, however, a musical society was founded in Louvain which was devoted to St. Cecilia. For centuries it has been the custom in different European countries to celebrate St. Cecilia’s festival day on November 22d. In France these celebrations took on much significance. At some of them prizes were awarded and among the competitors was Orland di Lasso. In 1708 Pope wrote his memorable ode to St. Cecilia, and various settings of this ode have been made by Boyce, Wesley, Hubert, Parry and others. Masses have been written to Saint Cecilia by Gounod, Adam, Thomas and others. The Basilique or church which now stands over the last resting place of St. Cecilia in Rome was built by Pope Paschal I. It is one of the sights of the Eternal City and is visited by travelers from all over the world. The church and the crypt where the bodies are buried may be seen on all days except festival days. It is gorgeously embellished with art works, religious paintings, sculpture, etc. Just below the altar is a reclining statue of St. Cecilia by Maderno. It is in white marble with a frame of darker marble. The face is turned downward. In the nave there is a remarkable fresco representing the coronation of St. Cecilia by Sebastien Conca. The remains of the house occupied by St. Cecilia’s family were recovered under the direction of Cardinal Rampollo and are filled with interest. Here we see the evidences of early Christian civilization side by side with Pagan methods. You are reading Saint Cecilia, the Patron Saint of Music. from the July, 1909 issue of The Etude Magazine. Why American Girls Succeed in Opera is the next entry in The Etude.